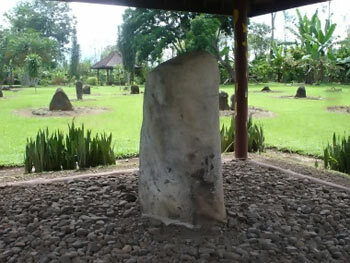 For the site-interested person of archeology (tour-history & the culture), in Pulau Panggung district, tourists could visit to the complex megalithic and Bedil Stone inscription. The inscription that was made in Sriwijaya royal era proofs the inhabitants' existence in this territory in the past that was connected with this kingdom. Gotten by 3 complexes was separated that was adjacent in Pekon Bedil Stone of the Upstream and Lower; 10 minutes by vehicle to the north from the Tegi gate of the Stone Dam complex. Back to Talang Padang district territory. The producer area of the quality rice superior, namely Talang-Padang rice was the last district from Bandar Lampung side before entered to Kota Agung district territory. Apart from ethnic Lampung the A dialect and O dialect, the community in this dynamic territory was Semendo, Java, Sunda-Banten and Jaseng (the acronym Java-Serang) ethnic -the term in Lampung for the Banten ethnic group had spoke Java. Since several of their generations have assimilation interacting so as many that could hold a dialogue in five languages at the same time.